Hello everyone. You are witnessing my first attempt at my new blog feature: Suit Up Saturday! 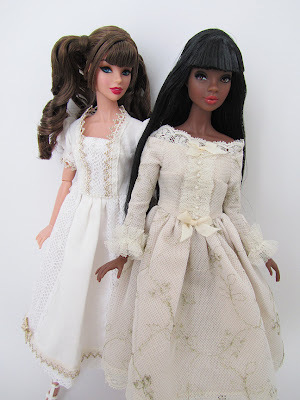 I have featured doll clothing before so it's not necessarily something new. But it is newly categorized for ease of searching this blog and just to help myself get a little organized really. And so, here are the two dresses by La Pierle called La Florentine and Memoires. I can't express enough admiration for the quality of these two lovely outfits. And the design on both is just timeless. When I saw these as I was browsing Flickr, my jaw literally dropped. 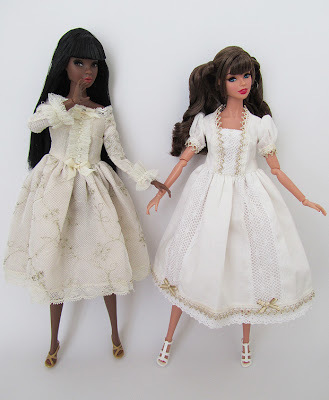 I love my modern dolls but nothing beats the classic look, hence, the reason it's called 'classic'. And La Pierle's work really shine on bringing about that aspect in her doll clothing designs. I had drooled over photos upon photos of doll clothing on her Flickr photo gallery until I caved one day and decided to contact her for a commission on two dresses I especially had my eyes on. According to La Pierle, vintage and laces were the inspiration for these dresses. Overall, she can draw inspiration from movies to books and more importantly, historical fashions, although none from these outlets are directly copied but rather combined with a modern twist and her own personal style. For more of La Pierle's creations, check her out in Etsy: HERE or her blog: HERE. Really beautiful dress. I especially love Rees in her dress. Her look really lends itself to this type of dress. Do the shoes come with the dresses? Congrats on your purchase! Beautiful dresses, they look so classic and innocent. I really love these! SO. Much.